Nice! Post a picture of the installation when it's done. Where did you buy the units? I'd be really nosy and ask how much they cost, but I won't since I don't really want to know anyway. I did the same, dual g5's, to replace a failing AI. Bonus benefit was tossing the standby vacuum pump in the trash, what a heavy little unit that was. It made space for a firewall mounted battery...and I ended up spending more then I should have, but the redundant AHRS and V/S pips are nice especially when the horizon is less definable in winter. If you have it coupled with a GPS or other, it makes approaches easier to shoot. I have not yanked off the vacuum pump yet. Too many other things popping up, not enough time at the hangar. So far 23.062 pounds from the panel area. Still need to pull the pumps and hoses in the engine compartment. I need to make a new panel plate. I am wondering if Carbon Fiber panels are strong enough to mount instruments? Carbon fiber is strong enough. I have seen many cub panels with nice gloss resin finish carbon fiber. I am yet to see a Skywagon panel like that though. Randy Appling has a Cessna 180 and does carbon fiber for a living. Look him up. Business name is Carbon Concepts. We have a carbon fiber panel in our experimental. It has a 10” hole cut in it for the EFIS plus all the other switches, comm head, intercom, etc. It holds up fine. I have my doubts it would be acceptable in the Cessna world. One thing I do not like about it is that it burns really hot really fast. I flame tested a scrap piece. Wow...like a blow torch. If I had it to do again it would be aluminum. If you are on a budget I would avoid carbon fiber. I have seen projects on hold for several months trying to get the cool water jet cut powder coated panel done. You can build what you need with hand tools in a day and get ready to fly. I need another turn coordinator.mine sounds like a coffee grinder. I wonder if the 2.25inch models save much weight? My bank could also use replacing. Since you're planning a whole new panel . . . . .
Have you ever thought about swapping the positions of your airspeed & altimeter with your navigation needles? I've never understood why airspeed is almost always located way over on the far left, instead of closer to the middle of the panel? During VFR, having AS & Alt in the center would allow both pilots to see these primary instruments clearly, and with a lot less head-swiveling & parallax for the pilot in the right seat. As a CFI, who sits in the right seat, it sure would help during instruction & demos. On the less frequent times when you're actually flying IFR, the more experienced pilot will probably be sitting in the left seat anyway, and having the nav-needles on the far left won't be an inconvenience. Besides, with so many airplanes now having a big-screen GPS also in the center of the panel, most of those old-school nav-needles are either removed, or only used as navigation back-ups. 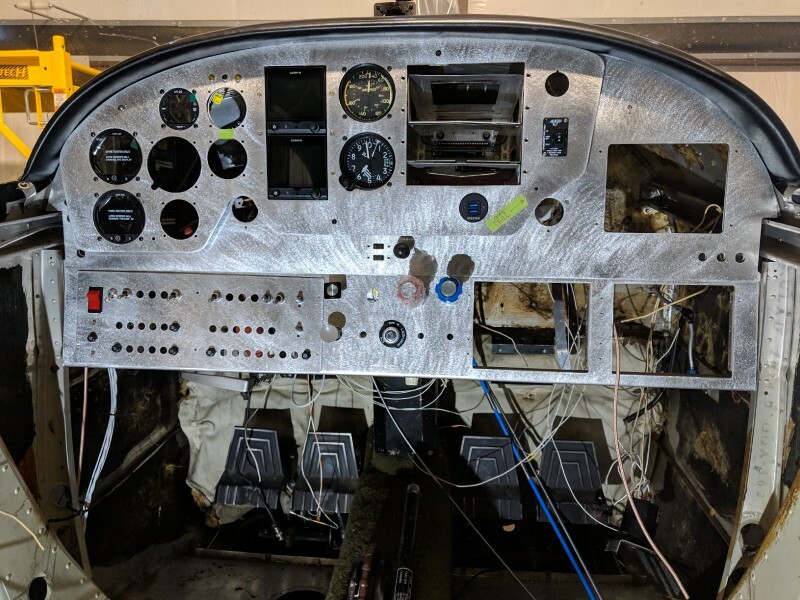 For years the pitot and static system instruments were over on the left side because that is where the Pitot line from the left wing and the static port are located. I think it was just a way to decrease the amount of tubing entangling with the wire bundles of the other instruments. I am building a tubing manifold system using color coded tubes. Red for Pitot and Blue for static. The two G5s and the Airspeed need both. The VSI and the Altimeter need static. I am moving the Airspeed and Altimeter further over towards the middle of the aircraft. And the VSI. On floats the VSI is super important. I need to find another aluminum plate to make a panel section. Mine has holes in the weirdest places... I could make it work, but it would always drive me nuts. I STILL NEED A BETTER TURN COORDINATOR AND VSI. Well, I could use the current panel section with all the extra holes and then cover it with a thin aluminum sheet or Kydex like a veneer to cover the un-used holes. I would need to make or find an adapter so the 2.25 inch radio face could fit in the bottom right hole. One of the middle small holes will be for the fuel totalizator.